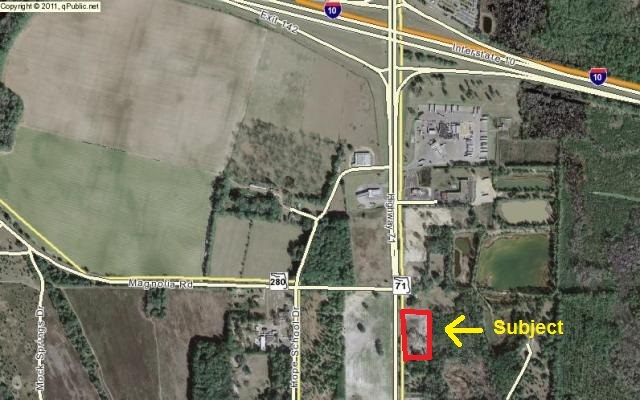 PRIME COMMERCIAL PROPERTY 3.5 ± acres of level land with 495 ' of frontage on Hwy 71 and 323 ' of depth only ½ mile South of Interstate 10 Exit # 142 in NorthWest Florida just 1 hour North of Panama City and 1 hour West of Tallahassee. This busy Exit # 142 has a Traffic Count of approx. 20,000± vehicles per day and has been developing rapidly over the past few years to become one of the Major Interchanges along Interstate 10 in the Panhandle area of Florida. Water, Sewer, and Natural Gas lines are already in place along the frontage of this property which makes Commercial Development much easier. This Exit # 142 is home to many National Chain Restaurants ( Ruby Tuesday, Pizza Hut, Burger King, Dairy Queen, McDonalds, KFC, etc ), Motels ( Fairfield, Hampton, Quality, Comfort, Microtel, Super 8, etc ), 2 Major Truck Stops ( Pilot & Travel America ), plus a WalMart SuperCenter and a Lowes, with plenty of traffic to support many more businesses. ACT NOW to take advantage of this GREAT OPPORTUNITY to purchase PRIME COMMERCIAL PROPERTY at a LOW PRICE.